Obligatory disclaimer! I received this bottle of Woodchuck’s new Cheeky Cherry Cider free for review. And I’m pretty darn excited about it because it’s a departure from Woodchuck’s other fruit-infused ciders. I enjoy cider more than beer in the category of easily quaffable alcohol, and I appreciate that Woodchuck has been successful enough to make it nearly a given that most supermarkets and bars will have a hard cider option. But in keeping with our American traditions, Woodchuck’s amber, peach, and pear ciders are generally much sweeter than European styles of cider-making…and well, I like it dry. So as I prepare to flip the lid on this Cheeky Cherry, I do so knowing it’s been quite some time since I’ve had a bottle of Woodchuck anything. 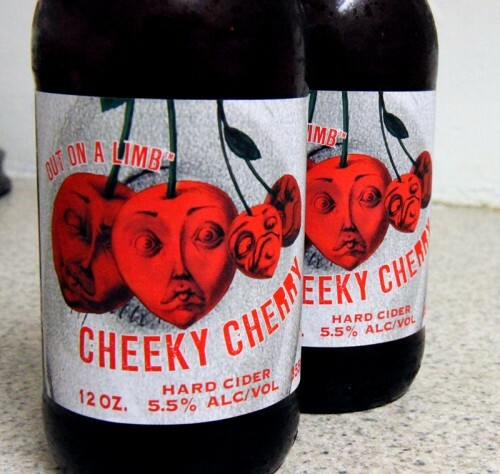 The Cheeky Cherry is made with bittersweet cider apples and infused with sour cherry juice after fermentation. It is meant to make you pucker, as the bottle label proclaims along with a selfie call to arms that I’d rather not repeat here out of respect to copy writers everywhere. I am reticent before trying it for the reasons I’ve already described, and I’m expecting a Sourpatch Kids version of a cider. My husband is a HUGE fan of sour beers, but admittedly, I am not that fond of them. Yet I find picturing a sour cider as a candied apple oddly appealing. It’s as blood red as blood red can get. For maximum punnage, I want to say it’s red delicious but it’s deeper, more sultry than that. There’s very little smell, maybe a little wood, which is unexpected. But I have a cold, so I’m probably imagining that. Tasting it, I’m surprised right away by how great it actually is. It’s much drier than their other fruit-infused ciders, which is most notable when it initially hits my tongue and after the cider has lingered for a while. The acidity is much less than expected, which is a boon for my taste buds. Think lemonade, not Lemonheads. This cider also captures apple and cherry notes in a harmonious blend that would run the risk of being so smooth, it’s boring…if the sour factor didn’t break through that with an aftertaste that entices me back sip after sip. I enjoyed it and wouldn’t hesitate to order it next time I want a cider. You can get it through March 2015 as part of Woodchuck’s Out on a Limb six-packs. I was expecting a sweet cider to pair with the holiday’s red coloring. Instead, and to my taste buds’ enjoyment, I tasted a dry cider (although not sure the exact R.S. level) full of apple and tart cherry flavors. In fact the tart cherry resides on the tongue long afterwards, with the apple’s acidity providing a lively finish. I was also expecting some artificial-ness with the cherry flavor; but no, the cider house infuses dried Michigan tart cherries into the already fermented cider plus a douse of Belgian cherry juice…Thumbs up for the Cheeky Cherry. 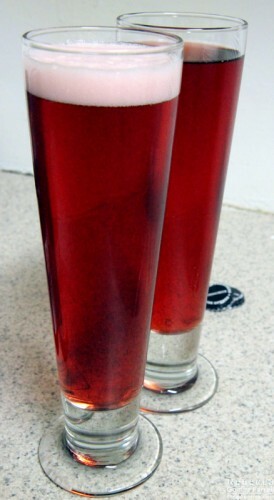 It pours to a medium carbonated cherry red color. The aroma captures both crisp apple and tart cherry. The crisp apple entry is met head on with tart cherry building to a sour cherry peak. The semi-dry fade is long with some bittersweet apple flavor on the sour finish.